Theresa Hak Kyung Cha came of age as an artist in the San Francisco Bay Area of the 1970s, a decade of enormous artistic, cultural, social, and political transformation. Despite her untimely and tragic death, she created an extraordinarily rich and complex body of work that reflected the profound developments of her time and place--including the radical changes in art--and her own cultural alienation. The Dream of the Audience, a touring exhibition organized by the Berkeley Art Museum, showcases the full range of work by this influential yet underrepresented Korean American artist, who worked in media ranging from performance, video, and film to artists' books, mail art, and works on paper and cloth. 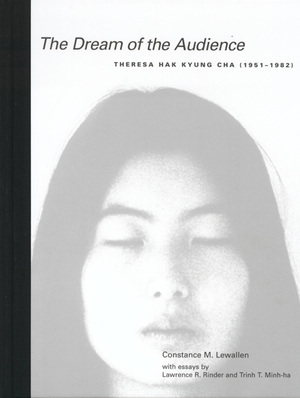 This book, designed to accompany the exhibition, is an essential reference to Cha's work. It contains three essays that provide an in-depth context to her visual art and the fullest analysis of her work to date. This volume's comprehensive view of Cha's oeuvre illuminates the recurring themes and formal approaches that distinguish her art. Constance M. Lewallen traces the influences on Cha's development while she was a student at the University of California, Berkeley, and places her work in the context of the artistic and social climate of the San Francisco Bay Area. Lawrence R. Rinder analyzes the theoretical underpinnings of the artist's multileveled and interrelated work. Trinh T. Minh-ha's essay is a poetic evocation of Cha's work as it relates to her ancestry and the suffering of the Korean people under the Japanese colonial policy of deracination. Together the essays show how her rich and original art is informed by a dizzying array of influences--from French film theory to Korean history. Constance M. Lewallen is Senior Curator at the Berkeley Art Museum and Curator of the exhibition Joe Brainard: A Retrospective. Lawrence R. Rinder is Anne and Joel Ehrenkranz Curator of Contemporary Art at the Whitney Museum of American Art and editor of Searchlight: Consciousness at the Millennium (1999). Trinh T. Minh-ha is a writer, filmmaker, and composer. Her work includes seven books--Woman Native Other (1989), When the Moon Waxes Red (1991), Framer Framed (1992), Cinema Interval (1999) and, in collaboration with Jean-Paul Bourdier, Drawn from African Dwellings (1996)--and six feature-length films, including A Tale of Love (1996) and The Fourth Dimension (2001). She is Professor in the Women's Studies, Film Studies, and Rhetoric Departments at the University of California, Berkeley.